Glazing does not break. No visible damage to glazing or frame. Glazing cracks but is retained by the frame. Dusting or very small fragments near sill or on floor acceptable. 3a High Very Low Glazing cracks. 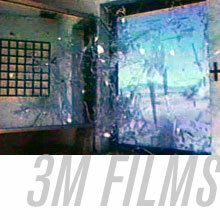 Fragments enter space and land on floor no further than 3.3 ft. from the window. Glazing cracks. Fragments enter space and land on floor no further than 10 ft. from the window. Glazing cracks. Fragments enter space and land on floor and impact a vertical witness panel at a distance of no more than 10 ft. from the window at a height no greater than 2 ft. above the floor. Glazing cracks and window system fails catastrophically. Fragments enter space impacting a vertical witness panel at a distance of no more than 10 ft. from the window at a height greater than 2 ft. above the floor. This test series showed that the 3Ms Ultra series of security window films provides significant benefit in mitigating window glass fragment environments in blast. Per the GSA criteria, 3M's 6 mil ULTRA S600 (.006 inches) 3M films performed to the required levels for many of the configurations tested. Both products performed well up to blast pressures as high as 9 psi. Many configurations tested performed to the required level of protection for GSA Level D buildings at the maximum design load - up to 15 psi and an impulse of about 82 psi-msec. In its strongest configuration, 3Ms ULTRA S600 (with the IPA and IPP on Annealed IG units) achieved a Very High protection level and a Condition 3B on the GSA rating scale when tested at theequivalent of 200 kg of TNT with a standoff distance of 97 feet, an impulse of 89 psi-msec, and a peak pressure of 17 psi.